Last Update 10:00: Hello everyone it’s blog-master Jason here. I’m sorry for no updates for the last 4 hours. Brett still doesn’t have power and my cable went out and I had no internet access for 2-3 hours. Anyway, just guesstimating that I have 18-20 inches at my house. I took my dog outside, who is around 17 inches tall on four paws, and the snow almost covered her whole body. Snow is winding down over Bucks county east. This has been some storm, I have to say that nobody will see anything like we’ve experienced for the last 6 days for a long, long time. Moderate to heavy snow continues to fall as wind gusts are on the increase in both frequency and strength. 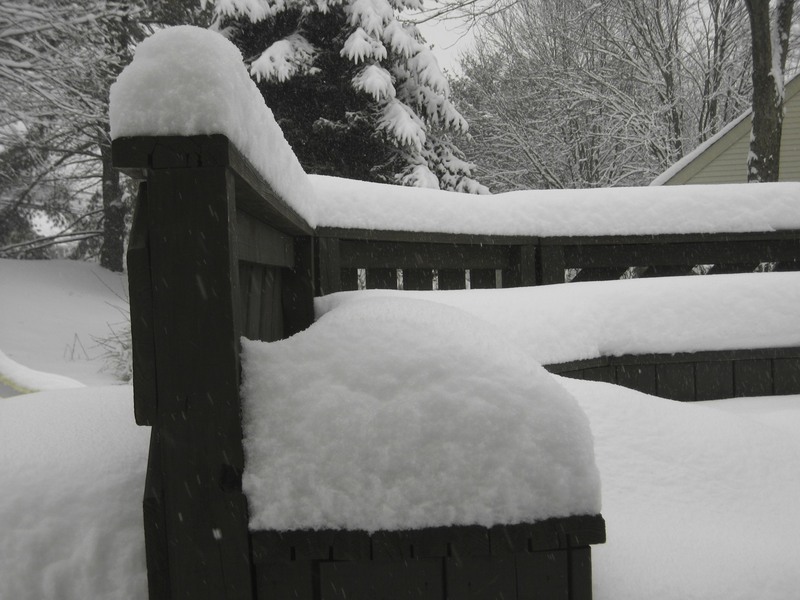 Ridiculous amounts of snow have accumulated on my deck over the past two storms (about 30 inches in some places). This storm, in my humble opinion, deserves “severe” status because of the length and heaviness of the period of snow and the wind strength, causing blizzard or “white-out” conditions. I look forward to keeping you posted on what’s happening in my neck of the woods for the rest of the storm. 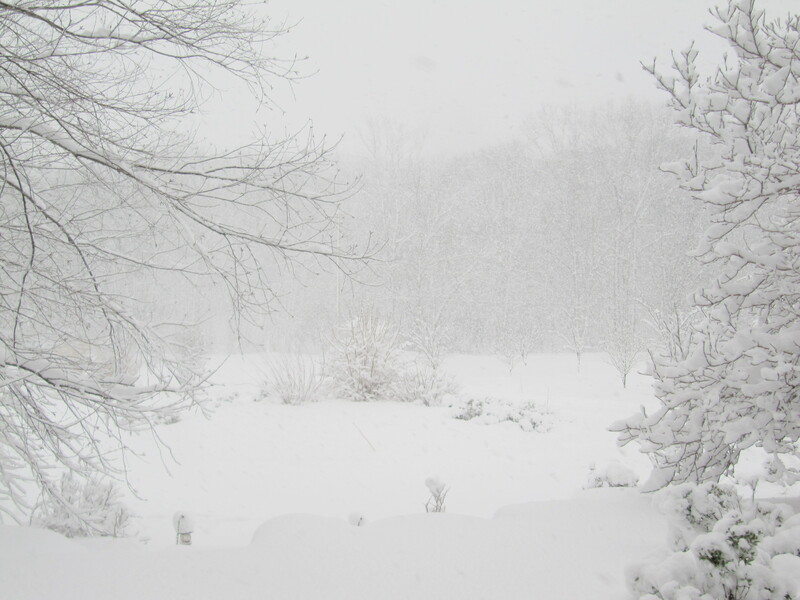 Update at 2:30 from blogmaster Jason Hirsch : Just went outside into the blizzard. I actually got blown over by a super-strong wind gust! 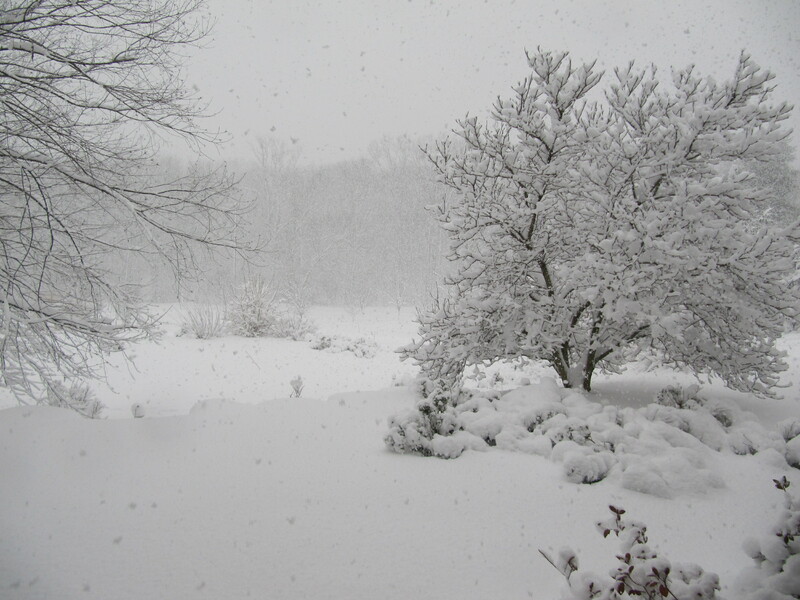 Snowing heavily now, I have around 10 inches at my house accumulated. The next few hours will be the worst of the storm as the low pressure wraps up and gets cranking out into the Atlantic. Already, it can be seen on the radar that the storm is indeed starting to wrap its moisture around it and intensify. 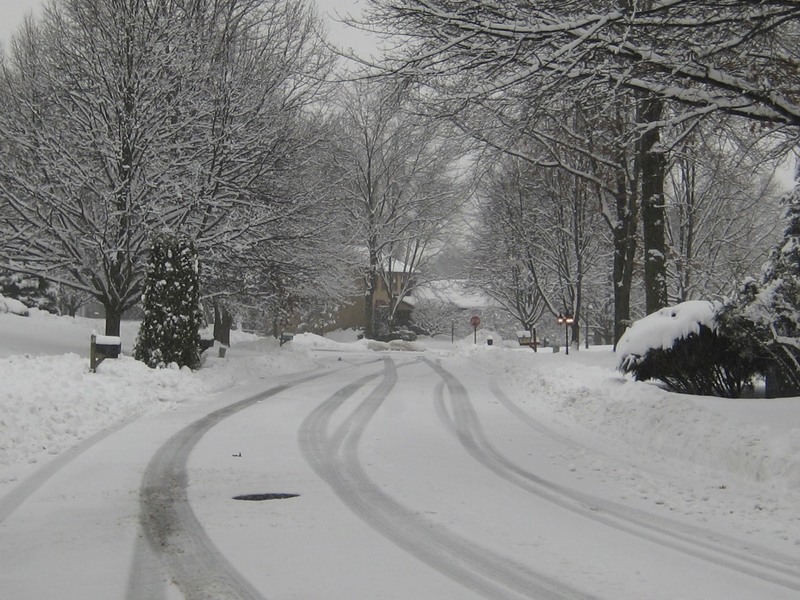 As Jason mentioned above, there is a blizzard warning posted for this afternoon, so, if you look outside and see that it has stopped snowing don’t be encouraged to go out on the roads or discouraged because of the lack of snow…. IT’S COMING!!!! Anyway, as Joe Bastardi always says, “Enjoy the weather, it’s the only weather you got.” Below is a radar shot from 8:30 am. Hello everyone, the National Weather Service has issued a blizzard warning just like I said a few posts ago. Right now some light snow if falling at my house and my guess is that we have 3-4 inches on the ground already with the worst to come. We are sticking with my snow map which shows 14-20 inches of snow. falling for most of the coverage area. We will have another update at 10:30 AM with some pictures (hopefully and the three day forecast with a little discussion for the upcoming storm on Monday Night). Enjoy the snow, signing out, Jason. Tuesday Night 10:55 PM: I’d like to welcome the latest member of the Philaburbia Weather squad, Brett Wiley! He will be a correspondent for the blog and will sporadically put in his input of the weather.. He has been studying the weather with me for many years now and his knowledge about weather is outstanding! Snow is still falling here at my house! Well, the storm is underway at my house in Bucks County. We have around a coating already on the ground with much more to come. Comment, or send me your observations with the city you’re in, and I’ll post it on the blog! What do you Think About this Storm? Some kid should probably get out there and shovel that deck, don’t you think? Laying around the house all day, bloggin’ and watchin’ television ….